In order to drive revenue growth, many companies have increased the introduction of new products. This, combined with a growing number of marketing channels, has placed additional demands on marketing organizations. In response, many CMOs at leading firms are overhauling marketing operations to improve agility, decrease cycle times, and increase throughput and efficiency. They are significantly increasing marketing productivity. One of the tools that helps them drive these improvements is Lean thinking. Lean originated in manufacturing with the Toyota Production System and can be defined as a strategy for continuously improving the delivery of value to customers. 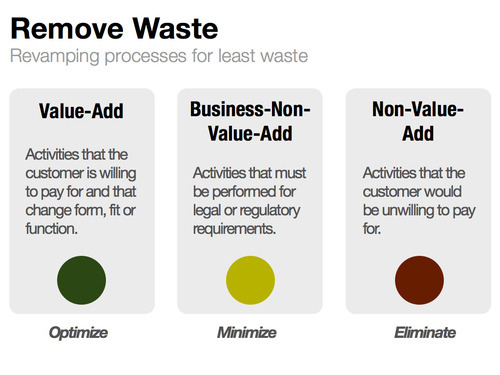 Lean seeks to remove waste and inefficiency from processes. By thinking about activities in terms of waste, Lean thinking helps marketers examine their activities and processes in new ways. Any activities that are non-value-add should be minimized or eliminated. One of the tools in Lean to help with this is called a Value Stream Map. In the example Value Stream Map below, a marketing request goes through a typical process for approval, development and deployment. The time for each activity is listed. The waste activity in this case is time spent waiting for approvals, waiting for resources to be assigned, and waiting as the request is handed off between different teams. The value-add activities are the activities where the actual work is being performed. The ratio of value-add time to total cycle time is called the process cycle efficiency (PCE) ratio. In this example, the PCE is 14%. Most operating processes have a PCE of 10% or less. World class performance is considered to be 50% PCE and higher. 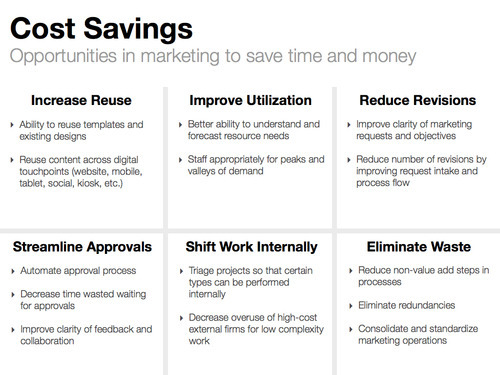 Most marketing processes have plenty of room for improvement. 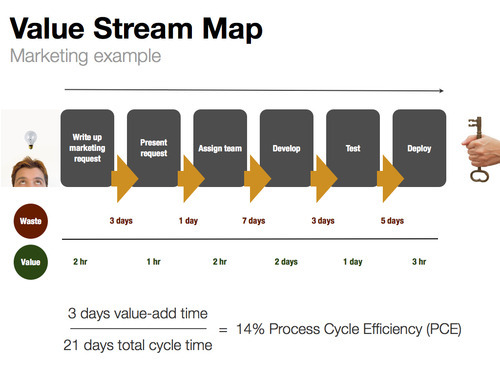 A value stream map is a helpful tool when improving marketing productivity, which is a product of both efficiency and effectiveness. Key drivers are: business process improvement, customer impact, and success in driving revenue. The push to increase marketing productivity is here, and Lean thinking is helping many marketing organizations rise to the challenge. 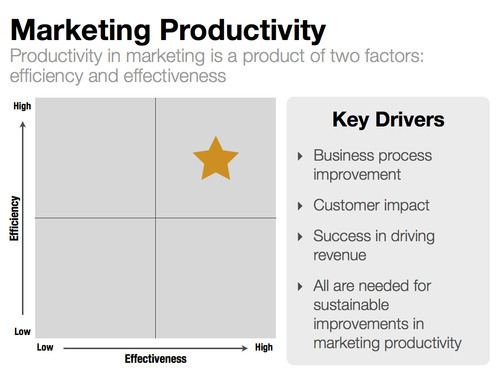 Has your organization begun to optimize marketing? Has efficiency improved? Has effectiveness increased? What approaches are yielding the greatest benefits? * Jain, N. and Seiler, M. (2002) The Case for Marketing Resource Management. Excerpt from Freeland, J. The Ultimate CRM Handbook: Strategies and Concepts for Building Enduring Customer Loyalty and Profitability.